Ready to turn prospects into new patients? Across all medical and healthcare practices, one leading marketing indicator is crystal clear: Healthcare consumers want to purchase medical services the same way they like to purchase anything else—by researching online, reading reviews, and seeking referrals. In today’s world, health professionals simply must establish themselves as reliable and reputable sources through their websites and social media sites online—because that’s where their patients are looking for information and guidance. 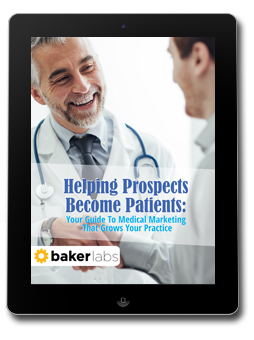 Our free eBook, Helping Prospects Become Patients: Your Guide To Medical Marketing That Grows Your Practice, tells you how, when, and why patients research for healthcare topics and treatments online. It also tells you how to create online content that actually attracts new patients, and how to harness the power of social media. With clear tips and inspiring examples, this 16-page eBook will help you grow your practice by leading prospective patients through their online searches straight to your waiting room.